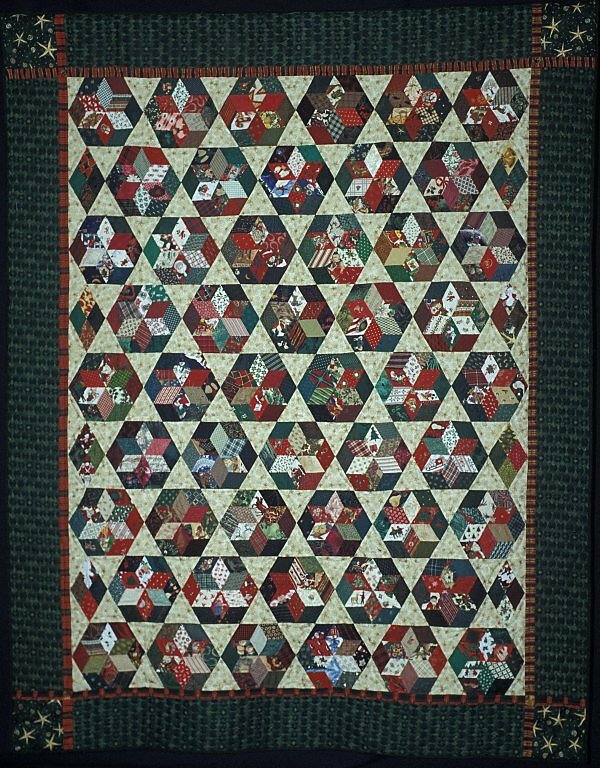 Charm and Multi-fabric Scrap Quilts 1984-2001: Charm quilts are those that have one shape and no duplications in fabric. Multi-fabric refers to those that have a very large number of fabrics but include different shapes. This was my first appliqué piece of any size. I made it one summer in Dewey Beach, DE, and drove 100 miles just to get two of the fabrics. Starting with a Jinny Beyer border stripe and a curved pattern I liked, I challenged myself to become an expert at machine piecing curved seams and to use a different fabric for each block. It was amazing to realize how many colors actually coordinated. 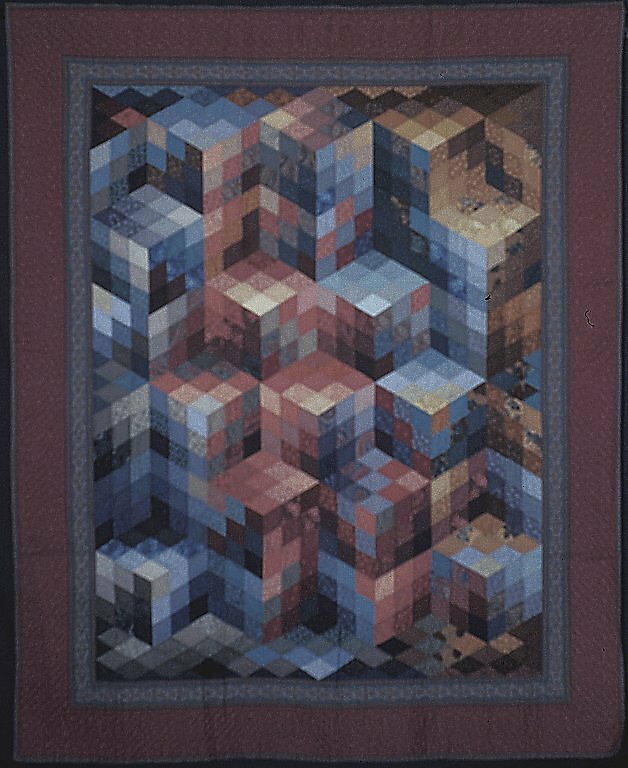 I had trouble coming up with a name for this quilt, but during a program I was giving, a friend commented that the individual blocks looked like a female figure. She then asked if I had seen Chorus Line, which of course I had. 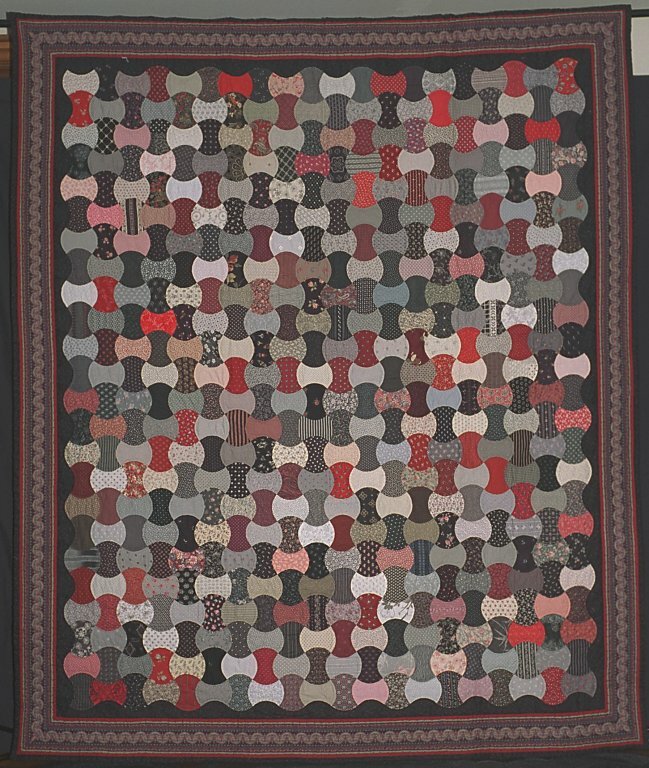 When this was in a magazine once, I told the editor the name and, since he didn’t think the readers would appreciate the humor, the alternate title is Charm Quilt #480 as it includes 480 different fabrics. This was one of my first multifabric scrap quilts. 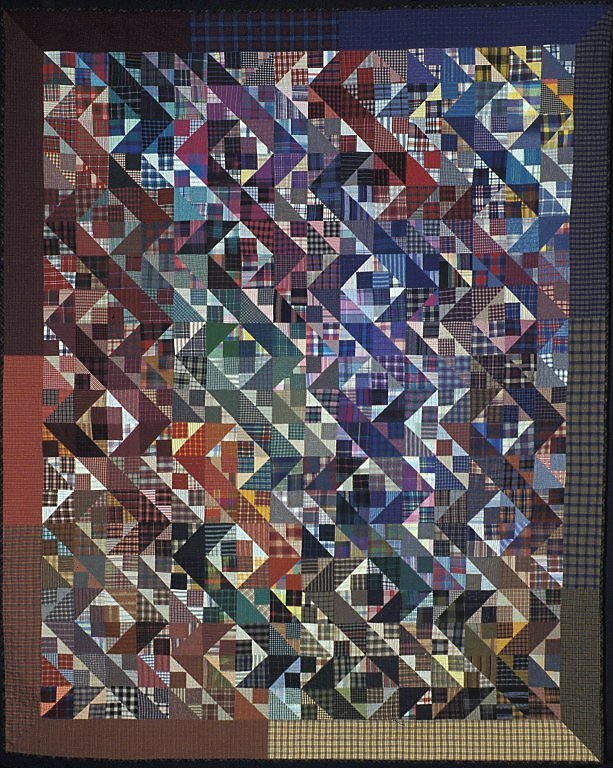 I was inspired by a quilt by Jinny Beyer called Ode to Vasarely. Combining the fabrics to create the illusion of depth was a real learning experience. 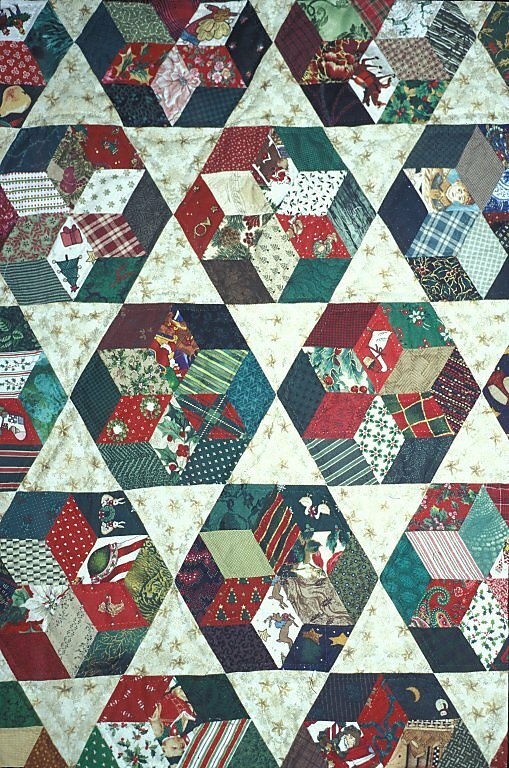 Many of the fabric diamonds came as the result of a trade I made with a friend. I knit something for her and she cut fabrics for me. 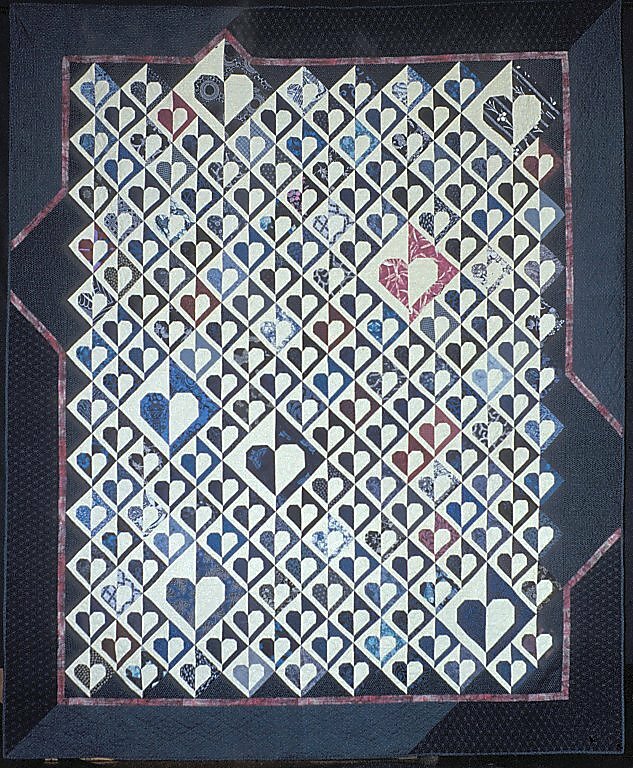 I always liked this friendship pattern and asked my Dirty Dozen friends to make a block for me one year. After realizing how many fabrics I had that would coordinate, I made dozens of blocks from my stash. 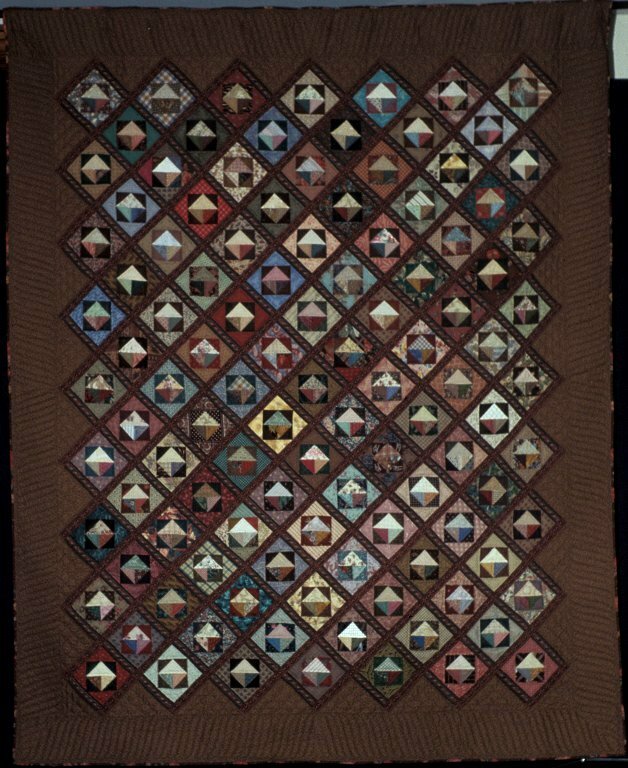 Although I love the quilt, it is not made with colors I want in my bedroom. It has found the perfect home with my sister, Charlotte. 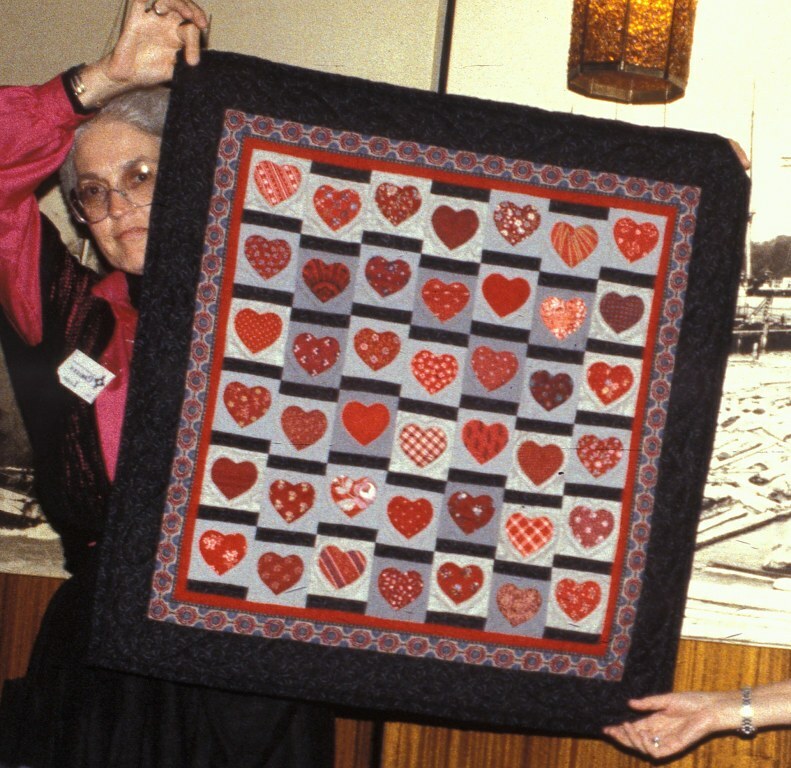 When I was big QU president from 1989-90, I organized a fundraiser for the YMe breast cancer support group using this pieced heart pattern and all those wonderful Japanese fabrics that I loved. 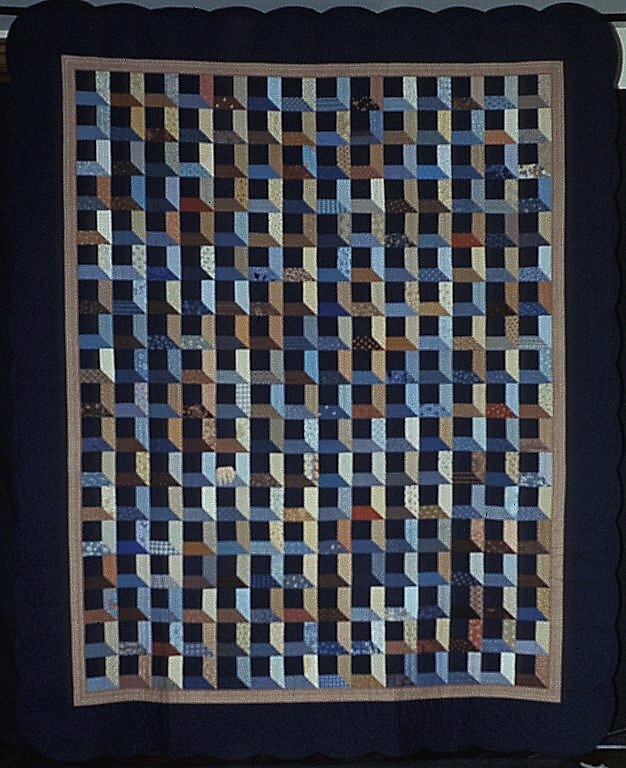 I liked the finished product so much I made this one that is similar to the fundraiser quilt. I have never been particularly fond of Christmas fabrics, but challenged myself to do something with them. I used a sixty degree diamond pattern and set them to look like stars that are set together with triangles. I then gave all the leftovers to my sister, Dorothy. 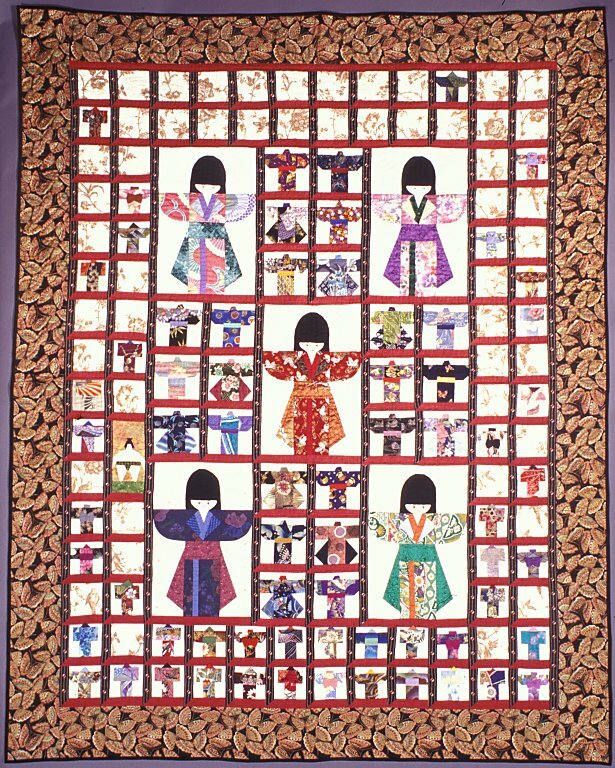 Small pieces of Japanese type fabrics collected between 1988 and 1999 combined well with assorted kimono patterns. 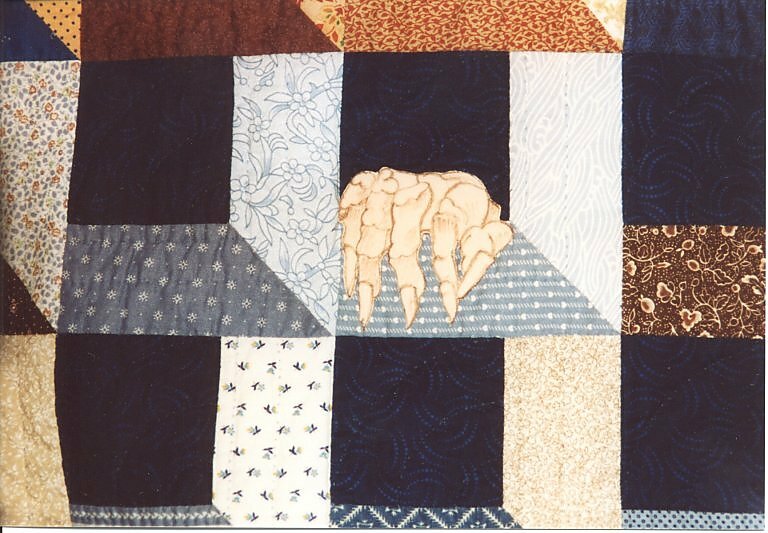 After completing the quilt top, a friend informed me that it was missing something and she knew what it was. 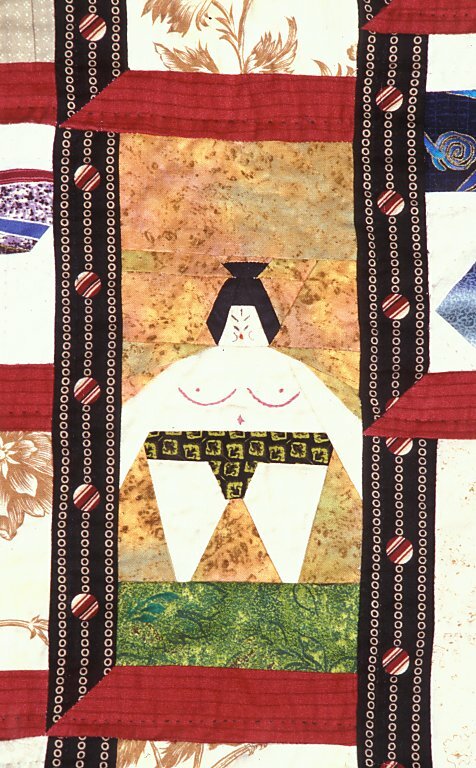 When she told me about the sumo wrestler pattern I knew he had to be included. The faces were drawn by a friend, JoAnn Law.